With the growth of small businesses, freelancers, and entrepreneurs, there has been a demand for more business tools that work anytime, anywhere, and on any device, reducing the need for inefficient and time-consuming paper processes. These online tools for invoicing provide a way to automate much of the process, freeing up the small business owner to do more to grow their business or drive revenues. Many of these invoicing tools do more than provide a way to send a bill or invoice; they also offer estimates, time tracking, payments, expense management, project management and more. We like to see how Due.com stacks up against our competition. Due.com vs our competition is one of the best ways that we can find out how to be better and make you the very best product available. It’s our goal and everything we strive to do. Check out these 101 invoicing tools, platforms, and software that are free, have monthly service fees, subscriptions or licenses to buy. See how we stack up! Obviously we put our company Due first. Due is an online invoice, time tracking, project management and credit card payments platform designed to help companies of all sizes with its scalable solution. It offers a digital wallet, integration with Basecamp, and the ability to accept all types of payments. Due also offers credit card processing rates that are the lowest in the industry. If you can find a better rate than Due, they will beat it! Account Sight is a time tracking and billing company for professional services organizations, offering an affordable way to invoice and get paid quickly. The main features offered are time and expense tracking as well as invoicing and reporting solutions. They offer a very seamless integration with QuickBooks so you can easily sink up your time tracking on Account Sight with the accounting benefits of Quickbooks. Account Sight vs Due: Account Sight offers solutions similar to Due, but does not include project management or payment processing options. Apptivo is affordable SaaS business management software for SMB. Its ERP apps include project management, CRM, invoicing, supply chain management, and more. Apptivo’s services branch out well beyond invoicing. They allow users to fully customize applications and share sections across all apps. The integration with Google apps is also very useful as it will sync all your contacts, calendar info, tasks, and google drive. Apptivo vs Due: Due does not offer a CRM solution, but includes features such as payment processing and other accounting solutions that fully fit a small businesses needs. Aynax offers online invoicing for small businesses, including features like templates that improve the look, feel, and brand connection of invoices. You can send an invoice by email and as long as you use the Aynax service, you will get a read receipt when the customer opens the invoice. Aynax also lets users include payment options like PayPal and credit cards into their invoices. This free online invoicing solution is perfect for any small business. Aynax vs. Due: Aynax focuses solely on online invoicing. Like Due, Aynax offers customizable invoices that allow customers to pay with various options including PayPal and credit cards. However, Due offers a much larger set of features to their users. These features include: an e-commerce payment processing API, digital wallet, time-tracking, project management, and much more. Ballpark offers web-based invoicing, invoice templates, time tracking and more for small businesses, freelancers, and startups. With Ballpark, you can start using their service with a 14-day free trial to get the hang of it. After your trial is over, there is a 3-tired pricing structure that you can reference for the best fit for your business. You can easily import data from other apps you use like Freshbooks, which will earn you 50% off your first four months with Ballpark. Ballpark vs. Due: Both of these services offer time tracking and online invoicing. With Ballpark, you have to pay a monthly fee to continue to use the service after the trial period is over. Invoicing on Due is completely free, no hidden or monthly fees. In addition, Due allows you to include credit cards as a payment option for your customers where Ballpark only offers Stripe and PayPal as options. Due also offers a much larger set of features to their users. These features include: an e-commerce payment processing API, digital wallet, project management, and much more. Bill & Pay is a complete invoicing and payment solution that will streamline your accounts receivable process. Customers can also accept e-checks/ACH and credit cards. With Bill & Pay you can also seamlessly integrate with plenty of other accounting software solutions. With low monthly and per transaction fees and no set up costs, this is an extremely affordable solution for any merchant account. Bill & Pay vs. Due: Bill & Pay does offer a free trial, however once the trail period is over a monthly fee is required to continue using their services. Bill & Pay offers payment processing solutions but it’s through a gateway, which means they will take a small fee on top of the fee associated with whichever processor you connect with. With Due, all invoicing, time tracking, project management, and reporting features are completely free. In addition, their flat processing fee of 2.8% is among the lowest in the industry. Bill.com handles accounts receivables and accounts payables, including invoicing, billing, and payments for businesses of all sizes. It offers a wide range of payment processing features as well as online billing and invoicing. With Bill.com you will go completely paperless with your accounting. You will have digital access to all of your financials with the click of a button, this will surely save you lots of time and money. Bill.com vs. Due: Bill.com offers a risk free trial, and then offers a 3 tiered pricing structure that charges per user per month. Unlike Due, Bill.com will actually mail your checks and invoices for you if you haven’t gone completely paperless. With Due, you can go completely paperless by sending and receiving invoices entirely online. Due also offers a much larger set of features to their users. These features include: an e-commerce payment processing API, digital wallet, project management, and much more. BillAnywhere allows small businesses to run their businesses from anywhere. This cloud-based system offers invoicing, billing, accounts payable, and employee management to occur all within one platform. You can sign-up for free and add features with a tiered pricing structure. BillAnywhere vs. Due: BillAnywhere offers plenty of useful resources for any small business. For an individual, these features would be mostly free, as you move up the tiers in pricing you will be billed monthly. With Due, all invoicing, time tracking, project management, digital wallet, and reporting features are completely free. Due also offers payment processing solutions for businesses of all sizes. BillBooks is an online invoicing system that offers a way to create branded invoices and estimates as well as manage expenses and clients, create reports, and make smarter decisions related to getting paid. BillBooks beautifully combines a seamless UX with a stunning UI to create a concise accounting solution for businesses of any size. BillBooks vs. Due: With BillBooks you can start with a free package, and allows you to “buy as you go”. The more invoices you need to send the less you will pay per invoice. BillBooks also allows you to accept online payments. Due also offers a much larger set of features to their users. These features include: an e-commerce payment processing API, digital wallet, project management, and much more. In addition, all features excluding their processing fee are completely free of charge. Billdu is a modern invoicing tool for freelancers and small companies to issue invoices and other documents anytime and anywhere. It also allows a small business owner to create a website. Billdu is also optimized for mobile phones and tablets allowing you to invoice like a pro at all times! Billdu vs. Due: With Billdu, you have to pay a monthly fee to continue to use the service after the trial period is over. Invoicing on Due is completely free, no hidden or monthly fees. Due also offers a much larger set of features to their users. These features include: an e-commerce payment processing API, digital wallet, project management, and much more. Bill4time features time tracking, invoice creation and management, billing and reporting processes, online payments and mobile accessibility. You can familiarize yourself with the platform by signing up for the free trial today! You can sign up for different pricing plans depending on if you’re using this service for personal or enterprise purposes. Bill4time vs. Due: With Bill4time, you have to pay a monthly fee to continue to use the service after the trial period is over. Invoicing on Due is completely free, no hidden or monthly fees. While both services offer payment processing on invoices, Due also offers a much larger set of features to their users. These features include: an e-commerce payment processing API, digital wallet, project management, and much more. BillQuick is a time tracking, invoicing, billing, accounting and project management platform for small businesses and specifically professional services organizations. BillQuick is perfect for specialized accounting software use. If you’re an architect or an engineer and are looking for a specific products catered to your business needs, BillQuick is the right solution for you. BillQuick vs. Due: BillQuick has lots of accounting and business tools catered to specific needs. Due offers a more general solution for businesses. With fairly similar feature sets, the main difference is that Due offers the services completely free of charge whereas BillQuick charges monthly. BillTrust is an online invoicing solution that provides automated invoice delivery, electronic invoice payment channels, and cash application solutions to create a more effective Payment Cycle Management system for companies. BillTrust also provides an eAdoption team that will give you access to their own personnel in assisting with driving traffic to electronic invoices and delivery payments. BillTrust vs. Due: With BillTrust, all invoicing is cloud based and can be delivered in any format you’d like. Invoicing on Due is only offered in an online format. Due also offers a much larger set of features to their users. These features include: an e-commerce payment processing API, digital wallet, project management, and much more. Billing Booth is a web-based system with features like billing and invoicing, recurring charges, reporting, pricing models and API access. Billing Booth provides a super seamless integration with their API, request access now! Billing Booth vs. Due: The starter pack for Billing Booth is free. However, in order to unlock more features you have to pay a monthly fee. These feature include: unlimited customers, unlimited users, and unlimited recurring charges. Due also offers a much larger set of features to their users. These features include: an e-commerce payment processing API, digital wallet, project management, and much more. Billing Orchard works like a company’s accounts receivable department, offering recurring invoices, online invoices, integration with Quickbooks, time tracking, website design and cash flow analysis. Billing Orchard vs. Due: Like Due, Billing Orchard has invoicing features, recurring payments, and ability to accept credit cards at 2.9% + $0.29/transaction. In addition, you must pay $29/month to use these services. Due offers these same features but free of charge and charges 2.8% flat for credit card transactions. Due also offers a much larger set of features to their users. These features include: an e-commerce payment processing API, digital wallet, project management, and much more. BillingServ is a cloud-based online ordering and invoicing system for companies. It offers invoicing, estimates, automated payment reminders, reporting and more. It also integrates with all types of software, including Basecamp, Quickbooks, Sage and more. BillingServ also offers plenty of demo’s to go through to get a look and feel for the service before actually signing up. BillingServ vs. Due: BillingServ offers fairly similar features to Due, but offers much more payment methods to choose from including Stripe and global payment options. BillingServ offers a basic starter package, but in order to utilize the full fleet of features, you must pay a monthly fee. Due offers virtually the same features but free of charge and cheaper credit card processing fees. BlinkSale offers unlimited invoicing and estimates as well as complete customization, payment options through Strip, reminders and reports to facilitate this business process. BlinkSale also offers a free trial before you sign up. When you’re ready they make it super simple with one plan and one price for all the features. BlinkSale vs. Due: Blinksale offers customizable invoicing solutions for users. In addition, you can pay with credit card via a Stripe integration. Due charges 2.8% flat for credit card transactions which is cheaper than Stripe’s 2.9% + $0.30 per transaction. Due also offers a much larger set of features to their users. These features include: an e-commerce payment processing API, digital wallet, project management, and much more. Blue Collar Software is ideal for those businesses that are service based. It offers a complete business management solution, including estimates, scheduling, accounting with invoicing features, client management, project management, customers and administration. Blue Collar Software vs. Due: In addition to invoicing, Blue Collar Software offers prospecting and CRM solutions for small businesses. Depending on how many features you want to utilize, it can get a bit pricey. Due offers very similar solutions free of charge. Due also offers a different set of features to their users. These features include: an e-commerce payment processing API, digital wallet, project management, and much more. Box Billing is open source billing software with a powerful, yet simple, platform for billing. It offers numerous applications and templates as well as easy integration with websites and numerous applications. Box Billing is a very new platform and offers a wide range of services for an extremely affordable price. They offer demos for both admin’s and client’s so you’ll have a great idea of how the software will function for your small business. Box Billing vs. Due: Box Billing offers invoicing and client management software at a very low licensing cost. Due offers the same invoicing software but completely free of charge. Due also offers a much larger set of features to their users. These features include: an e-commerce payment processing API, digital wallet, project management, and much more. Busy Bee Invoicing is ideal for small businesses, freelancers, and contractors. It’s available for Mac, PC, and mobile environments, offering an effective way to create and send invoices online for faster payment. Busy Bee Invoicing vs. Due: Busy Bee Invoicing is a very basic invoicing solution for your business, and is fairly inexpensive. Due offers the same invoicing software but completely free of charge. Due also offers a much larger set of features to their users. These features include: an e-commerce payment processing API, digital wallet, project management, and much more. Cashboard is cloud-based software for small businesses and offers a way to create and send invoices online. It runs on any web browser or mobile device operating system. Features include estimates, online payment acceptance, timesheets, time tracking and more. If you’re a freelancer, this service is a great solution for you. All your freelancing needs are covered with an extremely affordable monthly cost. Cashboard vs. Due: Cashboard offers similar features to Due such as invoicing, time tracking, and project management. However, there are monthly fees associated with using all of these features. Due offers the same features as Cashboard completely free of charge. Due also offers digital wallet and a payment processing API for e-commerce businesses. Cheddar Getter caters to companies that use one-time or subscription billing for their products and services. Features include subscription metrics, a secure and reliable process for selling and billing, and billing and subscription billing tools. Cheddar Getter is a great solution from small businesses to large subscription commerce companies. Cheddar Getter vs. Due: Cheddar Getter focuses mainly on subscription billing management software. With Cheddar Getter you can accept payments via PayPal or credit card. In order to access the full set of features you are required to pay a monthly fee. Due allows you to access these features completely free of charge and has a much lower credit card processing rate at 2.8% flat. cInvoice is an open source software solution for creating and distributing invoices online for freelancers and developers. cInvoice vs. Due: cInvoice is a very basic invoicing solution mainly targeted to the freelancer audience. Due offers invoices as well as plenty of other awesome features. These features include: an e-commerce payment processing API, digital wallet, project management, and much more. CloudBooks app is a complete Online Invoicing software solution designed for billing, project management and time tracking. It is among best Online Invoice Software trusted by small businesses around the globe. 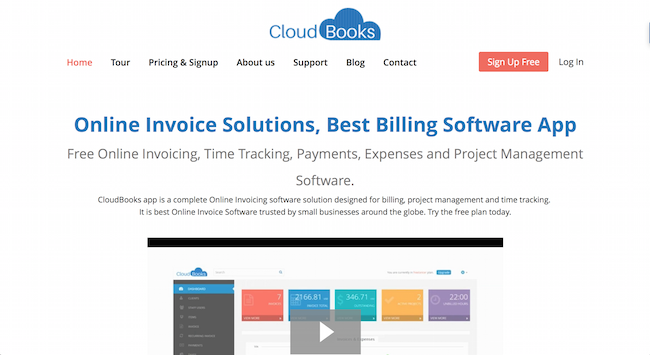 CloudBooks vs. Due: Like Due, CloudBooks offers invoicing, project management, time tracking, and billing features. CloudBooks offers a basic package and then requires monthly payments starting at $10 per month. Due offers the same features but completely free of charge. Due also offers a much larger set of features to their users. These features include: an e-commerce payment processing API, digital wallet, and much more. Coupa Invoicing is part of a much larger suite of tools designed to handle all aspects of your business, including inventory, procurement, budgeting, expenses and analysis. It is built for larger organizations and meant to serve as the accounts payable department in those organizations. Coupa’s goal is to save your business money. Head over to their website and calculate your ROI using a simple savings calculator. Coupa Invoicing vs. Due: Coupa offers a wide range of business tools to a wide range of potential businesses. In addition they offer services that are specifically catered towards your ERP, role, industry, or business size. Depending on which tools you want to utilize, Coupa can get a bit pricey, despite their guaranteed savings. Due offers the majority of these same features as well as a digital wallet and a payment processing API for e-commerce businesses completely free of charge. Crave Invoice is for small businesses and is designed to handle invoicing, inventory, expense tracking and accounting tasks. It also offers multiple currency support. Crave Invoice allows you to start a 30-day free trial before signing up, with no credit card required. Crave Invoice vs. Due: Like Due, Crave offers invoicing with expense management features. Crave allows you to take a 30-day free trial and then requires monthly payments starting at $49/month for the desktop version. Due offers the same invoicing software but completely free of charge. Due also offers a much larger set of features to their users. These features include: an e-commerce payment processing API, digital wallet, project management, and much more. Deskove is an invoice app that also includes time and expense tracking, project billing, account reports, online payments, and client management. Companies can accept PayPal and credit cards for online payments. Get started for free and check out the wide breadth of features Deskove has to offer, when you’re ready to scale up you can pay per Deskove user. Deskove vs. Due: Like Due, Deskove offers invoicing with expense management features. Deskove allows you to take a free trial and then requires monthly payments starting at $10 per month per user. Due offers the same invoicing software but completely free of charge. Due also offers a much larger set of features to their users. These features include: an e-commerce payment processing API, digital wallet, project management, and much more. Due is an online invoice, time tracking, project management and credit card payments platform designed to help companies of all sizes with its scalable solution. It offers a digital wallet, integration with Basecamp, and the ability to accept all types of payments. Due also offers credit card processing rates that are the lowest in the industry. If you can find a better rate than Due, they will beat it! Ecount ERP is a powerful solution for larger businesses, offering tools for inventory, production, sales, purchasing, payroll, collaboration and accounting (including invoicing). Ecount ERP is also 100% cloud based so you can share data in realtime whenever and wherever you want. Consult with some of their experts to find the perfect solution for your small business. Ecount ERP vs. Due: Unlike Due, Ecount ERP offers small business solutions such as sales and CRM tools. Depending on your needs however, Ecount ERP may get quite expensive. Due offers basic solutions for your small business completely free of charge. Due also offers a different set of features including: an e-commerce payment processing API, digital wallet, project management, and much more. The E-invoice Suite is made for larger companies and integrates with many ERP systems. It is for inbound and outbound invoices and offers invoice creation, management, and processing as well as payment notifications. The E-invoice Suite vs. Due: The E-invoice Suite offers invoice processing for both online and paper invoices at a price. Although Due only offers online invoicing, it’s completely free of charge. Due also offers a much larger set of features to their users. These features include: an e-commerce payment processing API, digital wallet, project management, and much more. Elorus Invoicing is free online invoicing and billing for freelancers and small to medium companies. Features include multiple users, multiple currencies, custom reports, scheduling and responsive design. Go check out their website and take a tour of all the awesome capabilities of this software for your small business. Elorus Invoicing vs. Due: Elorus Invoicing offers invoicing solutions starting at a free plan, if you’d like to bill more than three clients however, you are required to pay a monthly fee billed annually. Due offers invoicing to unlimited clients completely free of charge. Enliven Software is designed to help companies make their accounts payables and accounts receivable more efficient, including features like e-invoicing, automated invoicing, and Quickbooks integration. Enliven also provides a seamless way to capture your customer data. This process can cost thousands of dollars, with Enliven you can save thousands by choosing one of their extremely affordable pricing models. Enliven Software vs. Due: Enliven is focused much more on accounting software such as optimizing accounts payable and accounts receivable for businesses. While it also offers invoicing, this comes at a price. Due offers the very basic small business needs completely free of charge. Express Invoicing offers customized invoices and quotes, email invoices, PDF invoices, recurring invoices, multiple tax rates, synching with computers and mobile devices, reporting and more. Express Invoicing vs. Due: Express invoicing is an invoicing solution that lets you create and send invoices via email, online, and mail. Due only offers online invoicing and it’s completely free of charge. Due also offers a much larger set of features to their users. These features include: an e-commerce payment processing API, digital wallet, project management, and much more. Enter Your Hours is hourly billing software that is ideal for legal firms, service professionals, and small businesses. Features include customized invoicing, an iPhone app, time tracking and Quickbooks integration. Enter Your Hours vs. Due: Enter Your Hours offers an invoicing solution starting at $19.95/month going up to $479.95/month depending on how many users and clients you are billing. Due only offers online invoicing completely free of charge. Due also offers a much larger set of features to their users that are also free. These features include: an e-commerce payment processing API, digital wallet, project management, and much more. EZ Invoice is one of the oldest online invoicing tools available. It now features a web and mobile app environment as well as customized invoices that can be saved and edited, unlimited print and email invoicing, multiple currencies, PayPal integration, payment tracking, and financial and customer reports. All of these awesome features come at a very affordable price. Try creating a few invoices for free to get the hang of the platform before signing up! EZ Invoice vs. Due: EZ Invoice is an invoicing solution that lets you create and send invoices via email, online, and mail. Due only offers online invoicing and it’s completely free of charge. Due also offers a much larger set of features to their users. These features include: an e-commerce payment processing API, digital wallet, project management, and much more. Facturandum is an online invoicing and estimates tool that offers complete customization, automated features, time tracking, reporting, mobile access, recurring billing and online payments through PayPal and Stripe. Facturandum allows you to sign up for free to test out the software before signing up for a monthly pricing structure. Facturandum vs. Due: Like Due, Facturandum offers invoicing as well as online payments and time tracking. However, for online payments, Due offers credit card processing while Facturandum does not. Due also offers a much larger set of features to their users. These features include: an e-commerce payment processing API, digital wallet, project management, and much more. Fast Bill was made for small businesses and entrepreneurs, offering customized and easy to make invoices, access for accountants or team members, expense tracking and organization, time tracking and more. With Fast Bill you will also get access to a virtual accountant who can help look over your books. You can even delegate some of the work to this assistant when you need to take care of other business needs. Fast Bill vs. Due: While Fast Bill does offer a free trial, in order to fully utilize it’s features including the payment processing, it requires monthly payments starting at $14/month. Due offers the majority of the same features completely free of charge, including payment processing at rates as low as 2.8% flat. Fast Due offers business forms and apps for many aspects of business, including collection apps for invoices and expense reimbursement as well as document management apps and other management apps. The apps are available for the desktop and iPhone. Fast Due is constantly making improvements and has a few products currently in Beta including ‘Estimate’ and ‘Request for Estimate’. Fast Due vs. Due: Like Due, Fast Due offers an invoicing solution that’s completely free of charge. Due also offers a much larger set of features to their users. These features include: an e-commerce payment processing API, digital wallet, project management, and much more. Free Invoice Maker is a very simple tool for making online invoices, including a basic invoice template with some ability to customize in terms of color and logo. It’s a free service. Free Invoice Maker vs. Due: Like Due, Free Invoice Maker offers an invoicing solution that’s completely free of charge. Due also offers a much larger set of features to their users. These features include: an e-commerce payment processing API, digital wallet, project management, and much more. Freshbooks is small business accounting software that offers features like invoicing, expenses, time tracking, payments and reporting. A small business can also accept credit cards and integrate their other tools like the ones they use through Google, Stripe, PayPal and Mailchimp. With Freshbooks you can cover nearly all of your accounting needs for your small business. Freshbooks also allows you to test the software for 30 days free before signing up. The pricing model is tiered to accommodate anyone from a freelancer to a large enterprise, find the model that’s right for you and you’re set! Freshbooks vs. Due: Like Due, Freshbooks offers a wide variety of business tools like invoicing, time tracking, reporting, and the ability to accept payments. The cost to accept credit cards and other payments start at 2.9% + $0.30 per transaction. Due allows you to access these features completely free of charge and has a much lower credit card processing rate at 2.8% flat. Fusion Invoice is a self-hosted invoicing solution that a small business or freelancer can buy rather than opt for monthly fees. It is completely customizable, works in multiple currencies, and integrates with PayPal and Stripe. The company also offers tech support and free upgrades as new features are added. Fusion Invoice vs. Due: Fusion Invoice offers invoicing solution that can be installed to your computer for a one-time charge of $60. Due offers online invoicing and it’s completely free of charge. Due also offers a much larger set of features to their users. These features include: an e-commerce payment processing API, digital wallet, project management, and much more. Go To Billing allows a small business owner or freelancer to work anywhere and manage all billing, invoicing, and payments, including using mobile apps. There are numerous ways to handle and manage billing and payments. Go To Billing vs. Due: Like Due, Go To Billing offers invoicing and payment processing solutions for businesses of all sizes. Go To Billing offers a demo, but then requires payment. Due offers online invoicing and payment processing completely free of charge. Due also offers a much larger set of features to their users. These features include: an e-commerce payment processing API, digital wallet, project management, and much more. Greener Billing is designed to help a company go paperless with its billing and payment processes. This company offers a way to create estimates and invoices, track payments, manage client profiles, allow unlimited users, customize all settings, schedule automatic invoices and accept PayPal for payments. Greener Billing vs. Due: Greener Billing offers a trial for their invoicing solution, but then requires payment either monthly or per invoice. Due offers invoicing completely free of charge. Due also offers a much larger set of features to their users. These features include: an e-commerce payment processing API, digital wallet, project management, and much more. Grizzly Quote offers a free way to create professional quotes and invoices as well as accept payments from any device. Other features include email and text updates to keep a business owner updated on payments and other important financial data. Grizzly Quote vs. Due: Both Due and Grizzly Quote offer free invoicing and payment processing solutions for small businesses. Although Due offers a much larger set of features to their users. These features include: an e-commerce payment processing API, digital wallet, project management, and much more. Harvest is a simple time tracking and invoicing solution that offers time sheet capability, invoicing and reporting, expense tracking, the ability to connect with over 70 business apps and payments with Stripe, PayPal, and more. It works on desktop, iPhone, Apple Watch, and Android. Harvest vs. Due: Depending on how many clients you choose to bill, you will have to pay to use Harvest. Due offers these features and much more completely free of charge. Hiveage is available in 140 countries and offers a wide range of invoice and payment features, including custom invoices and estimates, online payments, time tracking, mileage and expense tracking, financial reporting and recurring and subscription billing. There is an iOS app and desktop version. Hiveage can be optimized for use by anyone from an individual freelancer to a large enterprise business. They offer a very detailed and tiered pricing structure to fit your needs. Hiveage vs. Due: Like Due, Hiveage offers invoicing and payment processing solutions. After your 14-day free trial, Hiveage offers payment plans starting at $15/month. Due offers these features and much more completely free of charge. Inveezy is a UK company that offers a free online invoicing form. It’s a very simple tool that offers a way to fill in an invoice or use it to send a quote. A draft can be saved for later use. It can be customized with a logo and lists payment options like check, Stripe, or PayPal. Inveezy vs. Due: The Inveezy invoicing form is a very simple invoicing template that allows you to get paid by PayPal, Stripe, or Check. Due offers a much larger set of features to their users in addition to invoicing. These features include: an e-commerce payment processing API, digital wallet, project management, and much more. InvoiceASAP features mobile and Web invoicing, customer management tools, and reporting. It integrates with Quickbooks and Xero. Features include the ability to attach photos to invoices to show completed projects, signature capture, sales report, A/R management and mobile and Web payments through companies like WePay, Square, Authorize.net and PayPal. InvoiceASAP vs. Due: InvoiceASAP offers invoicing, CRM, and sales reporting for businesses of all sizes. After your free trial, you are required to pay a monthly fee starting at $3.99 per month. Due offers a different set of features to their users all free of charge. These features include: an e-commerce payment processing API, digital wallet, project management, and much more. Invoice2Go is a cloud-based invoicing system that offers templates, tools to create individual and branded invoices, and charts and reports. It allows a small business owner to accept debit and credit cards and works on Android, iOS, and Web. It also offers receipts2go as an app to organize expenses. Invoice2Go vs. Due: Invoice2Go offers an invoicing solution, after your free trial is over you will be required to select a payment plan based on the number of invoices you want to send out. Due offers invoicing and much more completely free of charge. Invoiceberry offers a way to create custom branded invoices that can be made into a PDF, printed, or emailed. It’s ideal for freelancers and small businesses as an affordable tool. It also includes quotes, reminders, a dashboard, expense tracking, reports, the ability to have multiple users, and the ability to create quotes and invoices in multiple currencies. Invoiceberry vs. Due: Like Due, Invoiceberry offers custom branded invoice solutions for freelancers and small businesses. Depending on how many invoices you want to create, you are required to select a monthly payment plan. Due offers unlimited invoicing completely free of charge as well as plenty of other awesome features. These features include: an e-commerce payment processing API, digital wallet, project management, and much more. InvoiceCare is a virtual accounts receivable staffing company that creates, manages, and tracks invoices for a business, handling all payments and reminders. With your input InvoiceCare creates a custom plan of execution specifically catered to your business. The staff at InvoiceCare works on your behalf and allows you to focus on more important aspects of your business while they handle getting your bills paid. InvoiceCare vs. Due: InvoiceCare focuses on optimizing your accounts receivables. Due offers a wide range of features completely free of charge. These features include: an e-commerce payment processing API, digital wallet, project management, and much more. InvoiceExpert is free downloadable software that provides a quote and invoice design tool, the ability to send quotes and invoices, and do recurring invoices. Other features include inventory control, purchase orders, customer management and vendor management. Invoice Journal provides a way to create and manage invoices with custom templates for both as well as email templates. Other features include inventory management, online payments, offline payment tracking, reminders, reports, and he ability to import Gmail contacts and export data to Excel. Multiple users can be assigned to the software. The Invoice Machine focuses strictly on creating professional invoices for freelancers and small businesses. It has an easy-to-use interface to design professional invoices in minutes that can be made into PDFs and emailed to clients. The Invoice Machine vs. Due: The Invoice Machine is an online invoicing solution that starts free, but requires monthly payments as you increase the amount of invoices sent every month and add other features. Due offers invoicing as well as many other features completely free of charge. Invoice More has an invoice generator that allows a small business to create and send invoices as PDF attachments to emails or to print and mail them. Online payments like credit cards and PayPal can be accepted and recorded. This Web-based invoice platform also features recurring invoice capability and notes and history for each client. Invoice More vs. Due: The basic features on Invoice More are free but if you want to add clients and utilize features such as payment processing there is a monthly fee. All of these features are free on Due. Invoice Ninja covers clients, quotes, invoices, payments and expenses. It also offers time tracking, the ability to import expenses, alerts and reminders, automatic billing, multiple currencies, 10 invoice template designs, and integration with more than 45 payment gateways. Invoice Ocean is a simple online invoicing system that is free if sending less than three invoices per month. IT offers a way to view invoices online or download them as a PDF. Features include multiple languages and currencies, reports, multiple users, online payments, and payment integration with multiple payment providers. Invoice Ocean vs. Due: The basic features on Invoice Ocean are free but if you want to add clients and more invoices there is a monthly fee. All of these features and much more are free on Due. Invoice-o-matic is a free basic online invoicing template that lets a freelancer or small business owner add in their details and send as a PDF directly to a client’s email. There are some customization features but this is a very simple invoice tool. Invoice-o-matic vs. Due: Invoice-o-matic is a basic and free invoicing template. Due offers free invoicing as well as additional features such as an e-commerce payment processing API, digital wallet, project management, and much more. Invoice Place is a UK-based company that offers a simple online tool to create quotes and invoices as well as receipts. All are sent directly to customers and clients via email. Features include multiple currency support, payment history, partial payment recording, and more. Invoice Place vs. Due: Invoice Place offers a basic and free invoicing template. Due offers free invoicing as well as additional features such as an e-commerce payment processing API, digital wallet, project management, and much more. Invoiced offers online invoicing, subscription billing, and payments. It integrates with PayPal, Stripe, Xero, Quickbooks and more. Offline payments are also accepted as well as online payments like credit cards, PayPal, bitcoin and ACH. Invoiced vs. Due: The basic features on Invoiced are free but if you want to add clients and more invoices there is a monthly fee. All of these features and much more are free on Due. Invoicera has an extensive amount of tools to manage time, estimates, expenses, finances, invoicing, payments, projects, staff, tasks, clients and credit notes. It also offers online payments, multiple currencies, and subscription billing. Invoicera vs. Due: The basic features on Invoicera are free but if you want to add features such as unlimited clients and invoices there is a monthly fee starting at $19.95/month. All of these features and much more are free on Due. iPayables automates the entire accounts payable process, including e-invoicing, payments, purchase orders and more. iPayables vs. Due: With iPayables, they will completely take over your account payables process. For this, they will charge about $1950/month. Due offers a more basic set of these features completely free of charge. These features include: an e-commerce payment processing API, digital wallet, project management, and much more. Less Accounting is robust accounting software that handles all aspects of a company’s financial management. This includes business expenses, invoicing, outstanding money, mileage tracking, proposal creation, bookkeeping and financial records, contacts and accounting reports. There is some third party integration capability. Less Accounting vs. Due: Less Accounting offers bookkeeping software for small businesses. Pricing starts at $70/month. With Due, you can access basic accounting features and much more completely free of charge. Lite Accounting is a simple online invoicing system that lets a small business owner create and send branded custom invoices as a PDF. Customers can view and pay these online invoices on the Web and pay through PayPal. Lite Accounting vs. Due: Lite Accounting offers basic accounting and invoicing features starting at $10/month. Due offers these same features and much more completely free of charge. MoneyPenny is small business accounting software that also handles CRM and project management tasks. Features include online invoice and estimate creation and management, expense and time tracking, time sheets, expense reports, graphs and charts, multiple currencies, document management, payment API integration, snap and go receipts, automated recurring invoices and payment reminders. MoneyPenny vs. Due: MoneyPenny offers basic time management, project management, and invoicing features starting at $15/month. Due offers these same features and much more completely free of charge. Mr. Biller is an easy to set up basic online invoicing system that provides an invoice template, customization, open API, intuitive visual design and reusable invoices. Mr. Biller vs. Due: Mr. Biller offers basic accounting and invoicing features for free. If you want to access premium features you will be required to pay $9.95/year. Due offers these same features completely free of charge. These features include: an e-commerce payment processing API, digital wallet, project management, and much more. Nutcache is a collaborative project management tool that has integrated time tracking, invoicing, and expense management. Features include online invoicing, sample boards, project workflow, access rights and permission and team collaboration tools. Nutcache vs. Due: Like Due, Nutcache offers a very similar set of features such as project management, time management, and invoicing. They also offer features Due does not have such as project workflows, team collaboration, and expense management. The basic package is free, if you want to utilize the premium features you will be required to pay a monthly fee starting at $5 per month per user. Due offers the majority of these features completely free of charge. Due offers a different set of features as well. These features include: an e-commerce payment processing API, digital wallet, and much more. Online Invoices is an easy online billing and accounting software solution. Its features include pre-filled invoice templates, email templates, customization tools, recurring invoices, time tracking, estimates, income and expense tracking, statement and reports, payments, reminders and the ability to attach documents. Online Invoices vs. Due: Online Invoices has similar features to Due such as invoicing and client management. Online Invoices also provides features that Due does not have. These include: sales management, inventory management, online accounting, and CRM software. The basic package is free, when you want to add more invoices and utilize the premium features you will be required to pay a monthly fee. With Due, you will have access to all features completely free of charge. Due also offers features that Online Invoices doesn’t have such as an e-commerce payment processing API, digital wallet, project management, and much more. PayPal is a known leader in payments. It also offers a simple and effective invoicing tool that has some customization and provides for online payments from customers and clients. PayPal vs. Due: Due and PayPal have a lot of similar features. Both platforms allow you to send and receive payments on the platform via a digital wallet experience as well as invoicing. PayPal is considered one of the payment “giants” and has expanded its capabilities beyond Due at the moment. PayPal allows you to use their mobile wallet to pay in-stores as well as mobile retailer capabilities. On an enterprise level, PayPal offers mobile card readers and point of sale integration. Both PayPal and Due offer checkout forms and credit card processing, the difference is the fees. For basic credit card processing in the United States, PayPal charges 2.9% +$0.30 per transaction. Due charges a flat 2.8% transaction fee for credit card processing. In addition Due offers features that PayPal doesn’t such as time tracking, project management, and reports. Pay Panther is a CRM, billing, communication, and integration platform that allows small businesses to handle tasks like document management, contact and project management, task workflows, invoicing, time and expense tracking, and more. Payment methods include eCheck, ACH, and credit cards. There is a client portal and over 20 reports. Integration includes Gmail, Quickbooks, PayPal, Stripe, Box and more. Pay Panther vs. Due: Pay Panther offers a similar feature set to Due. They both offer invoicing, credit card processing, project management, and time tracking. The main difference is pricing. Pay Panther requires monthly payments starting at $49/month for a basic package. If you want to be billed annually, Pay Panther offers 50% off on these payments. With Due, you have access to all of these features completely free of charge. Proper Invoice is a comprehensive invoicing solution that offers freelancers, startups, and small businesses a full-service solution for billing and payments. This includes flexible invoicing with discounts, terms, currencies and other options. Other features include numerous templates, online payments with Stripe and PayPal, reports, automatic alerts, email notifications and client portal. Proper Invoice vs. Due: Like Due, Proper Invoice offers invoicing and payment features for individuals and small businesses. They also both offer client management and reporting. Proper Invoice starts with a free package and then requires monthly payments starting at $4.99/month. Due offers the same features completely free of charge. In addition Due offers features such as an e-commerce payment processing API, digital wallet, project management, and much more. Quaderno offers automated accounting tools that simplify small business processes, including billing history, professionally designed invoices, tax compliance for multiple countries and integration with payment gateways, e-commerce platforms, collaboration and document management tools, and accounting software. Quaderno vs. Due: Like Due, Quaderno offers accounting tools such as invoicing, billing history, and a payment processing checkout API. The Quaderno checkout can be integrated with Stripe, PayPal, or Braintree. The main difference between the two is pricing. Quaderno requires monthly payments starting at $29/month. Depending on how many transactions and API requests you have, these fees can go up to $149/month. With Due you can access these features and much more completely free of charge. Quickbooks is a full-service accounting platform that also provides tools for invoices, online payment, and financial analysis. Quickbooks vs. Due: Like Due, Quickbooks offers features such as invoicing, expense tracking, and online payments. Unlike Due, Quickbooks offers a full fleet of accounting and tax compliance software that helps you stay ahead of the game. They also offer advisor programs that team your business up with Quickbooks personnel, all of these awesome features do come with a monthly fee. For basic features, you will be required to pay $5/month and for features like the advisor programs you will pay $349/year for the deluxe package. Due offers a basic feature set completely free of charge, as well as other features such as an e-commerce payment processing API, digital wallet, project management, and much more. Reliabills offers free branded and customized online invoices. Other tools can be accessed for a fee and include recurring invoices, relevant reporting, merchant account, collection automation, invoice payments and customer portal. This cloud-based system can be accessed anywhere on any device. Reliabills vs. Due: Both Due and Reliabills offer features like invoicing, reporting, client portals, and ability to accept online payments. With Reliabills, invoicing is free, but if you want to accept online payments you will be required to pay $24.95/month and 3% + $0.30 per transaction. With Due you get all these features and much more completely free of charge with credit card processing fees as low as 2.8% flat. Replicon is a workforce management platform that includes invoices, billing, time sheets, and project costing. It can be accessed via the Web or mobile environments. Replicon vs. Due: Both Replicon and Due offer invoicing, time tracking, and project management features. Replicon requires monthly payments depending on how many of their features you want to utilize. Due offers all of these features completely free of charge. In addition Due offers features such as an e-commerce payment processing API, digital wallet, reporting, and much more. Ronin is a basic time tracking and online invoicing app that works for freelancers, startups, and small businesses. It has limited features but has been proven to work well with smaller operations. Ronin vs. Due: Both Ronin and Due offer features such as invoicing, time tracking, project management, and payment integration. For the basic package Ronin is free, however if you want to utilize more of their features you will be required to pay monthly fees starting at $15/month. Due offers these features completely free of charge as well as an e-commerce payment processing API, digital wallet, project management, and much more. Sage is one of the biggest accounting software solutions in the world for companies of all sizes. It includes online invoicing as part of its overall accounting package. Sage vs. Due: Sage offers a plethora of accounting software solutions. Depending on which solution/package you want to choose you can access a variety of these features. Sage and Due both offer features such as invoicing, payroll, and ability to accept payments. Due offers a much more basic version of these features but it’s completely free of charge. There’s no need to mix and match features to fit your business with Due, what you see is what you get! SalesBoom offers online invoicing as part of a larger package that includes sales automation tools, CRM, and business process solutions. SalesBoom vs. Due: SalesBoom offers business tools such as cloud CRM for businesses of all sizes starting at $14/month. You can create and send custom made invoices with SalesBoom but will need to select a specific package. Due offers many of these same features completely free of charge as well as an e-commerce payment processing API, digital wallet, project management, and much more. Send Invoice is a UK company that offers an online solution for sending simple, yet customizable, invoices. This is perfect for small businesses and freelancers. Send Invoice vs. Due: Send Invoice is a basic invoicing platform that allows you to send invoices starting at £6.90/month (EU customers only). Due has the same invoicing capabilities and much more completely free of charge. Other features include an e-commerce payment processing API, digital wallet, project management, and much more. Simpler Invoicing is a Dutch company that offers an online solution for companies and freelancers to invoice their clients all over the world, including professional services organizations that are looking to go paperless with their billing processes. Simpler Invoicing vs. Due: Both Due and Simpler Invoicing offer an online invoicing solution for businesses of all sizes. Depending on which features you want to access, you will be required to pay monthly fees with Simpler Invoicing. Due offers these same features and much more completely free. Due offers other features such as an e-commerce payment processing API, digital wallet, project management, and reporting. Simply billing provides a dashboard for easy invoice creation and customization to send online invoices in minutes. It focuses strictly on the billing aspect of business. Simply billing vs. Due: Both Simply billing and Due offer invoicing and client management solutions. Depending on how many invoices you want to send and how many clients you have, Simply Billing requires monthly fees starting at $5/month. Due offers these same features and much more completely free of charge. Simplify This streamlines the invoicing, billing, and payments process by creating a cloud-based solution that can be accessed by anyone on the team from any type of device to keep cash flow moving. Simplify This vs. Due: Both platforms offer invoicing, billing, and payment processing for businesses of all sizes. The main difference is pricing. Simplify This charges monthly fees starting at $39/month. Due offers many of these features completely free of charge as well as an e-commerce payment processing API, digital wallet, project management, and much more. Siwapp is a free online invoicing software that is an open source Web application. That means that it is continually updated and improved by those that use it with new features and accessibility, This is an ideal choice for developers or even freelancers looking for an effective free solution for their billing needs. Siwapp vs. Due: Siwapp offers a free open source invoicing application that allows you to create customized invoices seamlessly. Due offers the same functionality as well as features such as an e-commerce payment processing API, digital wallet, project management, and much more, completely free of charge. Sleek Bill offers an intuitive invoice system that learns as it works within a business to do more and customizes its features based on how it is used. It requires an annual subscription and is then available on all devices with free upgrades. Sleek Bill vs. Due: Like Due, Sleek Bill offers invoicing and billing software for businesses of all sizes. Depending on how long you want to use this service, Sleek Bill requires payments starting at $29 (for three months). Due offers these same features completely free of charge as well as an e-commerce payment processing API, digital wallet, project management, and much more. SnapBill offers a completely automated system so a business owner can schedule bills, invoices, payments, emails and texts while SnapBill takes care of the rest. The billing data can also be synched with a number of external systems. SnapBill vs. Due: Like Due, SnapBill offers invoicing and billing software for businesses of all sizes. Depending on how long you want to use this service, SnapBill requires payments starting at $39/month. Due offers these same features completely free of charge as well as an e-commerce payment processing API, digital wallet, project management, and much more. Square is known primarily as a payments company but has expanded into the billing and invoicing side of business to provide a tool that effectively offers freelancers and small businesses a way to put all their billing online while accepting all types of payment methods. Square vs. Due: Square and Due both offer invoicing and payment processing features. Square offers POS payment processing capabilities while Due does not yet have that functionality. Square’s processing fees start at 3.5% + $0.15 per transaction for keyed in transactions (online). Due’s processing fees start as low as 2.8% flat, and offers unique features such as time tracking, project management, and a digital wallet. Street Invoice is a fast way to create branded and personalized invoices for customers all over the world. Features allow it to integrate with taxes and currencies from all over the world while working in a team environment so that it can be accessed by all virtual staff when necessary. Street Invoice vs. Due: Like Due, Street Invoice allows you to send and receive invoices seamlessly. Street Invoice has a basic starter package for free, but if you require premium features they will charge you a monthly fee starting at $4.99/month. Due offers these same features completely free of charge as well as an e-commerce payment processing API, digital wallet, project management, and much more. Time59 caters specifically to the legal industry for billing by the hour and for professional services. It also tracks expenses and time spent on projects and clients. Time59 vs Due: Like Due, Time59 allows you to send and receive invoices, track time and expenses, and much more seamlessly. Time59 allows you to take a 30-day free trial, then they will charge you an annual fee $99.95/year. Due offers these same features completely free of charge as well as an e-commerce payment processing API, digital wallet, project management, and much more. Timesolv focuses on professional services organizations and law firms, providing time tracking, expense tracking, billing and invoicing tools. Timesolv vs. Due: Like Due, Timesolv allows you to seamlessly track time and bill clients. Timesolv charges monthly fees starting at $34.95 per month per user. Due offers these same features completely free of charge as well as an e-commerce payment processing API, digital wallet, project management, and much more. Tipalti is a high-powered billing solution for global suppliers looking to automate their billing and payments system. Tipalti vs. Due: Tipalti and Due both offer invoicing functionality for business of all sizes. Tipalti is focused more on optimizing the accounts payable process. Due offers similar features completely free of charge as well as an e-commerce payment processing API, digital wallet, project management, and much more. Tools4com is an online invoicing solution that also offers refund invoices, pro forma invoices, notes, and customer and project management tools. It’s directed at small businesses and provides a basic invoicing system. Tools4com vs. Due: Tools4com and Due both offer basic invoicing solutions for businesses of all sizes. Tools4com charges users 5€/month for their basic package. Due offers these features completely free of charge as well as an e-commerce payment processing API, digital wallet, project management, and much more. TopNotePad is a comprehensive business platform that covers invoicing, accounting, and CRM within one solution for small businesses. Features also include expense management, estimates, and quotes. TopNotePad vs. Due: TopNotePad and Due both offer basic invoicing and accounting solutions for businesses of all size. Their basic package is free but if you want to utilize the full set of features you will be required to pay annual fees starting at $120. Due offers these features completely free of charge as well as an e-commerce payment processing API, digital wallet, project management, and much more. TradeShift is directed at industries that work with vendors and suppliers, offering numerous tools that include a free invoicing tool to facilitate payments. The other aspects of the platform are directed at enterprise processes. TradeShift vs. Due: Tradeshift and Due both offer basic invoicing and accounting solutions for businesses of all size. Due offers these features completely free of charge as well as an e-commerce payment processing API, digital wallet, project management, and much more. Vorex is a comprehensive solution that includes project management, CRM, expense and time tracking, and invoicing. Another feature is its ticketing and help desk processes. Vorex vs. Due: Like Due, Vorex allows you to send and receive invoices, track time and expenses, and much more seamlessly. Due offers these same features completely free of charge as well as an e-commerce payment processing API, digital wallet, project management, and much more. Wave Accounting is one of the most well-known comprehensive accounting programs available. Among its features are online invoicing tools, online payment acceptance, and reminders and automated invoicing tools. Wave Accounting vs. Due: Wave Accounting and Due both offer basic invoicing and accounting solutions for businesses of all size. Due offers these features completely free of charge as well as an e-commerce payment processing API, digital wallet, project management, and much more. WHMCS offers professional invoices, branding and customization, multiple currencies, numerous integrated payment gateways, ticket billing, late fees and reminders. WHMCS vs. Due: WHMCS and Due both offer basic invoicing and accounting solutions for businesses of all size. Due offers these features completely free of charge as well as an e-commerce payment processing API, digital wallet, project management, and much more. WinkBill is a fast, easy online way to create, manage, and send invoices. Features include invoice and email templates, payment and security gateways, dashboard, customization and more. It’s ideal for freelancers and small businesses that are starting out and need a reliable, secure online invoicing solution. WinkBill vs. Due: WinkBill and Due both allow you to create and custom and professional invoices. WinkBill charges you monthly depending on how many features you want to utilize starting at $9.95 per month. Due gives you access to these features and much more completely free of charge. WorkFlowMax was created by accounting giant Xero and it offers online invoicing, job costing, estimates, project management and more. This helps a small business handle many of its processes within one platform and integrates with Xero accounting if they use that system. WorkFlowMax vs. Due: WorkFlowMax offers accounting and CRM solutions for small businesses. Like Due, it offers plenty of features such as invoicing that are imperative in helping small businesses grow. WorkFlowMax charges monthly starting at $25/month per user. Due gives you access to these features and much more completely free of charge. Xero is a full-service accounting system that offers customized billing features and online payment options in addition to its suite of accounting and bookkeeping tools. Xero vs. Due: Xero and Due both offer basic invoicing and accounting solutions for businesses of all size. Due offers these features completely free of charge as well as an e-commerce payment processing API, digital wallet, project management, and much more. Yes Invoice was made for entrepreneurs and freelancers, offering an easy, affordable way to send invoices online and get paid quickly through a range of payment options that can be offered to customers. Customization allows branding to be extended to the billing process. Yes Invoice vs. Due: WinkBill and Due both allow you to create and custom and professional invoices and bill clients with a variety of payment options. Due gives you access to these features and much more completely free of charge. ZipBooks is free accounting software that includes online invoicing, time tracking, invoice financing and accounting features that handle all financial records and keep a small business compliant with taxes and financial statements. ZipBooks vs. Due: Like Due, ZipBooks offers a seamless invoicing and billing solution for small business for free. Due’s payment processing fee of 2.8% is much lower than those you would get from the ZipBooks payment gateways. Due offers all these features completely free as well as an e-commerce payment processing API, digital wallet, project management, and much more. Zoho Invoice is a free solution for online invoicing, payment reminders, and online payment receipt. Features include time tracking, automatic reminders, email notifications and expense management. Zoho Invoice vs. Due: WinkBill and Due both allow you to create and custom and professional invoices and bill clients with a variety of payment options. Depending on how many invoices you want to send, Zoho charges monthly starting at $7 per user per month. Due gives you access to these features and much more completely free of charge.